On 15 Jun 2015, Hossein Alimohammadi and Taha Kermani’s lawyer submitted appeal proposal to the court of appeal in order to investigate first court decision in violation of principle of acquittal because there are no evidence to support the issued sentence. 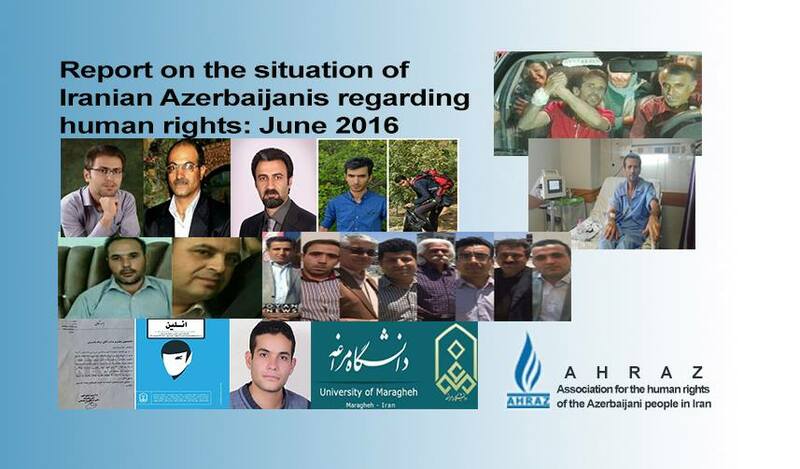 On 21 June 2015 their case has been sent to the Branch 7 of the East Azerbaijan Appeal Court by leadership of judge Mr. Ashrafi. On 22 June 2015, the Branch 7 of the East Azerbaijan Appeal Court sent files prepared against Mr. Alimohammadi and Mr. Kermani Azerbaijani Turk civil rights activists back to the Branch 3 of Tabriz Revolutionary Court for correction and removal of inconsistencies in the order. Hussein Alimohammadi and Taha Kermani two Azerbaijani activists were sentenced for total of 26 years (13 for each) imprisonment. On 12 May 2015, the third Branch of the Tabriz Revolutionary Court sentenced Mr Alimohammadi and Mr Kermani to 10 years imprisonment in charge of “insulting religious sanctities” and “public property distorter”. Previously on June 2014 they have been sentenced to 3 years of imprisonment. These sentences (3 years for each) had been suspended, however recently the Tabriz Revolutionary Court added the new sentence to the previous one. Hossein Alimohammadi arrested on 1 March 2015 and after serving 10 days on security forces detention, the he was transferred to section 12 of Tabriz Central Prison on 10 March 2015. The Tabriz revolutionary court accused Hussein Alimohammadi and Taha Kermani for several actions including “public property distorter”, however it has never been approved during investigation process. After spending 4 days at Evin Prison’s solitary confinement, Mr. Asadi Azerbaijani Turk civil rights activist and a physician (PhD) from Tabriz, was released temporarily for medical treatment on 31 May 2015. Recently, prison authorities have been shackling (forced positioning) Mr. Asadi in solitary confinement. Mr. Asadi was arrested on 12 July 2010 in Tabriz. He spent four months at Tabriz intelligence services place of detention, where he went through intensive interrogation. He was transferred to Tehran Evin Prison in late 2010, where he spent time in solitary confinement at section 240 & 209. In May 2012, after spending more than 20 months in prison without charges, Mr. Asadi was sentenced to ten years in prison on charges of “cooperating with enemy states” and “membership in the Muslim People’s Party (Khalghe Mosalman). The sentence was reduced to five years on second hearing. Asadollah Asadi developed severe depression in prison. According to local news agencies he was tortured during interrogation that lasted for long time. Mr. Asadi appeared five times at Branch 15 of Tehran Revolutionary Court, to verify confessions extracted from him under torture, and each time Asadi retracted the confessions. Reports indicate that Asadollah Asadi was threatened with execution, being thrown into the sewer, getting buried alive, and sticking his head into the toilette. At one point he was kept awake and standing up for five days, denied permission to lay against a wall or to sit down. Four members of the Bahadori family, Farzad Bahadori, Simin Rasouli and their children, Sahar and Nassim Bahadori , along with Shabnam Issakhani and Rashin Saberi were each sentenced to one year imprisonment. 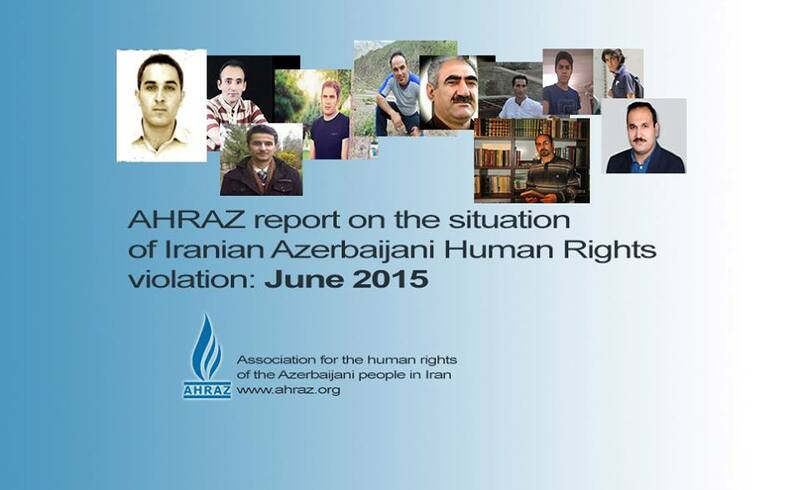 These six Bahais were arrested in Tabriz on 12 July 2014 by the Iranian Intelligence forces. From the date of their arrest, it is likely that they had gathered to celebrate the “Feast of Kalimat”, which Bahais around the world mark with prayers and readings from scripture. An Azerbaijani Turk civil rights activist from Miandoab City, East Azerbaijan province, was sentenced to 6 month in prison on the accusation of “propaganda against regime” by the Branch 102 of Miandoab City’s Public Court. The reason for his arrest is mentioned by Faramarz Abdi, the head of this court, to be ownership of unauthorized books, flyers, invitation letters to ethno-centric groups and elements as well as statements and implicit confessions made by the accused during the primary phases of proceedings. Mr. Seyfi was formerly arrested by the security forces several times in March 2015, September 2011, April 2010 as well as in 2005. The reasons for former arrests were mentioned to be involvement in ethno-centric activities, protest against negligence of Iranian authorities towards saving Urmia Lake and participation in the Sattarkhan’s anniversary ceremony. 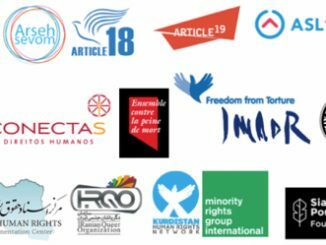 An Azerbaijani Turk civil rights activist was arrested by the security forces at his working place in 18 May 2015 and was transferred to the Section 12 of the Tabriz Central Prison after two days of interrogations. This activist was formerly arrested along with his brother and some other Azerbaijani activists during a demonstration in May 2009 at El Gholi Park of Tabriz City because of saying slogans about Azerbaijani language rights. He was then released on bail after 6 months in temporary detention. Mr. Mortaza was sentenced to three years in prison in 2009 by the Tabriz Revolutionary Court on the accusations of assembly, crime against national security and propaganda against regime. Mr. Hasani was temporarily released from Rajaei Shahr Priosn of Karaj after 30 months in prison for four days leave in 22 June 2015. It needs to be mentioned that each of the four members of the Board of Directors of Yeni GAMOH Party, namely Mahmoud Fazli, Ayat Mehrali Baglou, Behboud Gholizade, and Shahram Radmehr, were sentenced to nine years in prison on the accusations of establishment of an unauthorized group and propaganda against regime. An Azerbaijani Turk civil rights activist was released in June 2015 from Tabriz Central Prison after a year imprisonment. This activist was initially arrested in January 2013 by the security forces at his house in Maragheh City, East Azerbaijan province. He was then released on bail after two months in temporary detention in Maraghe Prison. The Branch One of the Maraghe Revolutionary Court sentenced this activist to a year in prison on the accusation of membership in groups aiming at disrupting national security. An Azerbaijani Turk civil rights activist was released in June 2015 from Sarab City Prison after two years imprisonment. This activist along with some other Azerbaijani Turk civil rights activists was initially arrested in May 2012 by the security forces in Sarab City, East Azerbaijan Province and was then transferred to the intelligence services place of detention. He was then released on bail after five month in temporary detention in Sarab Prison. The Revolutionary Court of Sarab City sentenced this activist to 2 years in prison on the accusations of “propaganda against regime” and “insulting the state’s Supreme Leader”. It is reported that he was beaten and tortured at the intelligence services place of detention in Tabriz and as a result he was twice transferred to Tabriz Emam Reza and Sarab Emam Khomeyni hospitals for treatments. The Ardabil Appeal Court rejected appeal prepared for Abbas Lesani Azerbaijani Turk civil rights activist from Ardabil on the claim of consistency of crime with punishment and eventually the court confirmed a year in prison for him. Need to be mentioned that in April 2015, the Branch 1 of Ardabil Revolutionary Court sentenced Abbas Lesani to a year in prison on the accusation of “propaganda against regime”. He was formerly arrested in Ardabil in September 2011 because of protest of Azerbaijanis against drying up Urmia Lake. He was then released on bail after 55 days in temporary detention. He was once sentenced to 30 months in prison because of participation in the public demonstrations of 2006 as well as participation in the annual ceremonies at Babak Castle in 2005. He was in prison in 2006-2008, part of which was spent in exile and prison in Yazd. He was formerly arrested many times in 2003-2005 during ceremonies at Babak Castle, participation in anniversary of the Constitution Movement in 2005, publication of Turkic calendar in 2003, protest at Ardabil Sarcheshme Mosque in 2004, participation at the anniversary of Azerbaijani martyrs of 2006 as well as on the occasion of Mother Language Day. Amnesty International and other human rights organizations defended him and have announced their concerns over him. Security forces in Urmia arrested Ata Karimi Azerbaijani Turk civil rights activist from Urmia, West Azerbaijan, in June 2015 and transferred him to an unknown location. Security agents confiscated his computer, books and other private belonging from his home. In the same week, three other Azerbaijani activists, namely Sina Hasani, Ali Azizi and Gholam Gholizadeh were also arrested in Urmia. Security forces also arrested Gholnaz Khorshid, Sina Hasani’s mother. Apparently, security agents intended to arrest Sina’s brother, but since he was not found there, they arrested his mother instead! His mother was released after some hours later. Court authorities informed families of the arrestees that these four arrested activists were in the custody of the Revolutionary Guardian Corps (RGC) in Urmia. These activists were released on bail after a week in detention. Previously, Gholam Gholizadeh and Sina Hasani were arrested by the security forces in June 2013 because of a trip to Sahand Mountain to participate at the ceremony of 26th June, the “International Day in Support of Victims of Torture”. They were released on bail after 6 days in the intelligence services place of detention. Previously, Ata Karimi along with some other activists was arrested in June 2014 on the accusation of propaganda against regime. He was also arrested in April 2010 because of participation in protest against Iranian authorities negligence towards drying up of Urmia Lake. On 29 May 2015, Hafez Sardarpour Azerbaijani Turk poet and former editor of the student journal “Kimlik” was arrested in Ardabil city/province by Iranian intelligence services. He was then released after a few hours. Mr. Sardarpour had been arrested before on 17 May 2010 along with six other Azerbaijani Turk activists in the town of Pars Abad, Ardabil province.